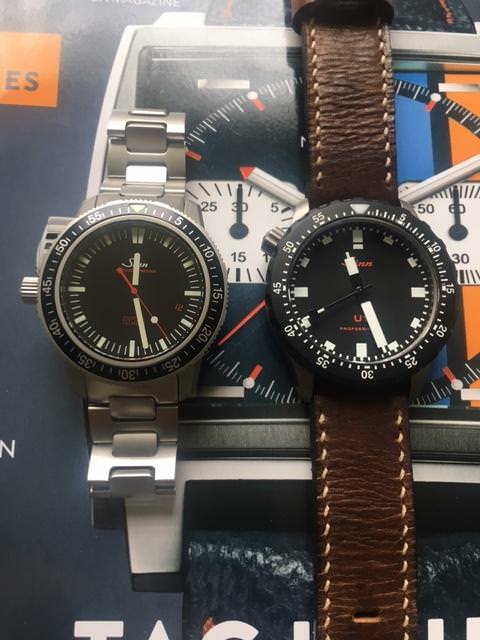 Sinn EZM2 Fix on Misaligned Hands? Ugh, Anyone have any experience fixing misaligned hands on an EZM2 without sending back to Germany? So, I got this from Ben a couple weeks ago and all has been good (see wrist pic from last weekend where the hands look fine), but at some point between then and now I recall resetting the time and advancing the date to set against my atomic G Shock, and now the hour and minute hands are no longer time aligned. As seen in the two comparison pics with the U1P, the hour hand is "behind" the minute hand by about 25 minutes such that when the hour hand is just slightly beyond the hour marker the minute hand is midway through the hour. The first pic shows the time when I aligned the minute hands with the U1P when both showing "11:32" (how i saw it today and realized something was off) and the second pic show the time when I advanced the minute hand an hour on the EZM2. I have played with just running it through a couple days, advancing the date, etc., and may do that a little more, but anyone know of a silver bullet fix? If not, anyone want a cheap EZM2 to send for service, or that you can read the time on if you know the hour hand is behind? 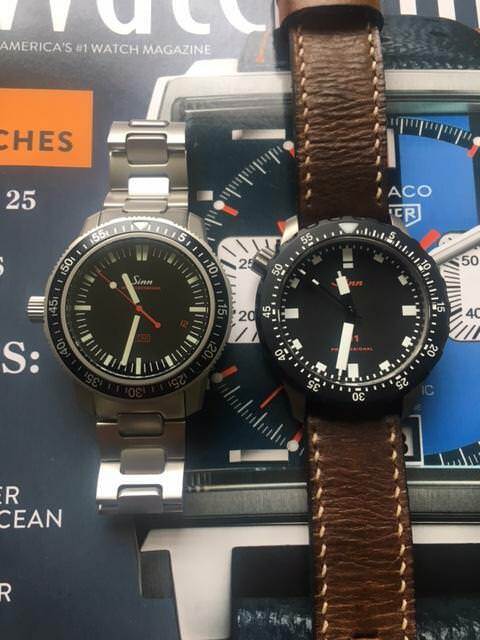 Re: Sinn EZM2 Fix on Misaligned Hands? Last I heard RGM wasn't working on the oil filled watches. I don't think you're going to find a very good domestic solution. I’m not a watchmaker, but it seems the hour hand has slipped on the pinion. Wasn’t that one recently serviced by Sinn? If so it has a service warranty, so it wouldn’t cost. I got Tuckers EZM2 after I bugged Wu for a while. It was perfect when I received it, but developed a bubble within a couple weeks. 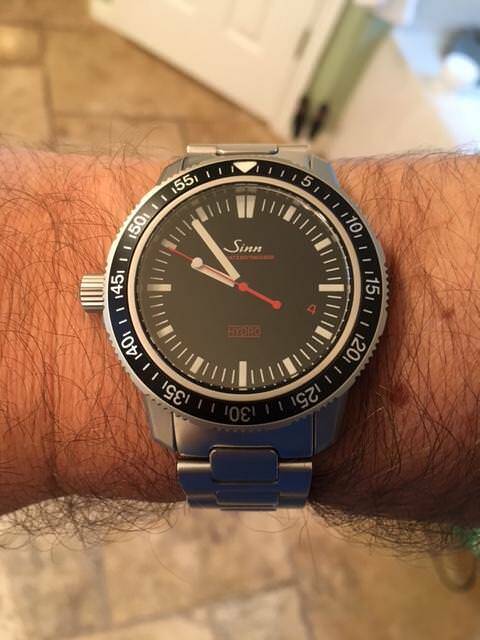 I contacted Sinn via email and they advised me to ship it back. Mine took 8 weeks for them to do a full no-charge service under warranty, but I paid about $65 USD for a new dial and handset. The only other cost to me were Customs fees. If you like the watch and it’s still covered, a couple months will have it back as new. I had this happen with a Seiko quartz one time, Jack fixed it. Hoppy is right, it unfortunately needs to take a trip to the motherland. So odd, wonder how this happened. Good thing is it will be covered under warranty. Will still costs to ship there probably- let me know and I can split fees with you. BBK357 wrote: Ah man, that’s crazy!! If you email Sinn they will send you a label. You’ll just have customs fees on return. At $65 USD for new hands and dial I recommend that too. Thanks guys. Ben, did you have any papers on this one, or do I just need the serial number to verify with Sinn re warranty, etc. RALAustin wrote: Thanks guys. Ben, did you have any papers on this one, or do I just need the serial number to verify with Sinn re warranty, etc. there's always the option of having RGM fix it and forego the oil filling, until such time that a trip back to Frankfurt is needed. I've got one without the oil, done by Sinn at my request, just wanted to see how it ran w/o oil. Just received my Sinn from German HQ after 8-9 months. kempoman wrote: Just received my Sinn from German HQ after 8-9 months. What did they do that took so long? My EZM2 had complete warranty service and was almost 8 weeks door-to-door. Perhaps mine is a chronograph. ouch, sounds like a pain: it must have been been caught up in the move and all.